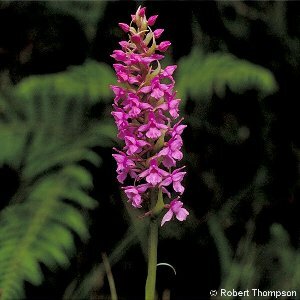 Fragrant Orchid (Gymnadenia conopsea) is so-called because of the powerful and very pleasant scent (but which some people think unpleasant!) emitted by the flowers. 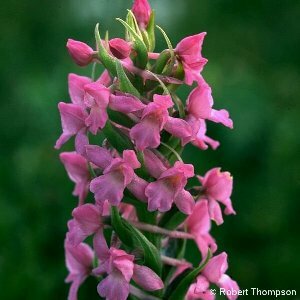 These are small and produced in fairly dense spikes; each flower is lilac, pink, or rosy-purple in colour, with a long fine spur. The leaves arise from the base of the shoot and are typically long and narrow, although forms of the plant with broad leaves do occur. The species can be divided into three subspecies or varieties, which some botanists regard as distinct species. 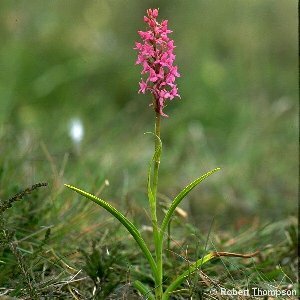 The commonest in N. Ireland is subspecies densiflora which has long, dense spikes and smells like a clove pink. 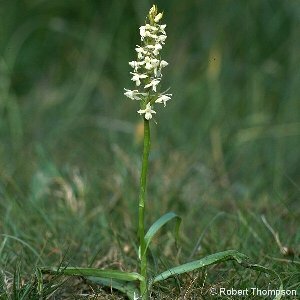 It is found in lime-rich grassland e.g. on the County Antrim coast. The underground parts consist of tubers divided into finger-like lobes. Flowering time is late June to August.